Duna as seen from orbit. Duna is the fourth planet from Kerbol and the fourth-largest planet. It is the Mars analog for Kerbal Space Program. It has one tidally-locked and large natural satellite, the moon Ike. 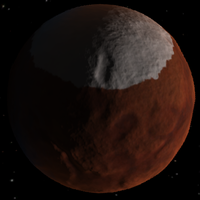 Duna is a terrestrial planet with a red-brown surface and polar ice caps similar to that of Kerbin. Duna's orbit has nearly the same inclination as Kerbin around Kerbol, making the planet one of the easiest to encounter. If the planets align properly, using a ballistic insertion burn from 100km, with proper aerobraking, a round trip from Kerbin to orbit around Duna and back requires ~1700 m/s of LKO delta-v, a relatively low amount compared to other interplanetary destinations. The trip may require a considerably higher delta-v budget for different orientations of Kerbin and Duna. A tutorial to get to Duna is available. “ Also known as the red dot that you can see if you squint at it really hard, Duna has long been a wonder to Kerbalkind. The planet has been held in much awe, due to its striking red color and stark contrast to the color green. Duna's terrain ranges in altitude from 124 to 8264 meters. Its mountain ranges are a peril to landing craft, due to their steepness and the limited aerobraking that is possible in Duna's tenuous atmosphere at such altitudes. Duna has several craters. They appear quite eroded, presumably by the wind. Several maria (large regions of dark soil) are around several hundred meters altitude. Their low altitude allows for more aerobraking, and the flatness of the terrain makes them easy but boring landing locations. These may have been lakes when the planet may have had liquid on its surface in the past. Duna's surface contains 3 anomalous features. Temperature and pressure of Duna's atmosphere as a function of altitude. Duna has a thin, cool atmosphere with a mass of approximately 3.0×1015 kilograms, a datum level pressure of 6.755 kilopascals (0.067 atmosphere), and a depth of 50,000 meters. Compared to the atmosphere of Kerbin, Duna's atmosphere has 1/15th the mass, 1/15th the surface pressure, and 1/9th the surface density. The datum level pressure on Duna is equivalent to that at an altitude of 14,975 m on Kerbin. The pressure at the top of Duna's highest mountain peak is only 2.4 kPa. The average molecular weight of Duna air is 42 g/mol, and its adiabatic index is 1.20. Although the composition of Duna's atmosphere is unknown, these values suggest that it may consist largely of carbon dioxide. Like all other atmospheres in the game, Duna's atmosphere fades exponentially as altitude increases. The scale height varies with altitude, which is a change from pre-1.0 versions of the game. 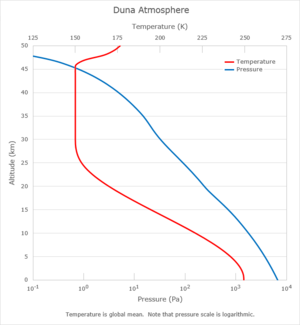 The pressure-altitude profile is globally constant and independent of temperature. The following table gives the atmospheric pressure at various altitudes above the datum level. The surface of Duna is cold, with a globally averaged datum level temperature of approximately -23 °C. Air temperatures decrease with increasing altitude to an altitude of 30 km. 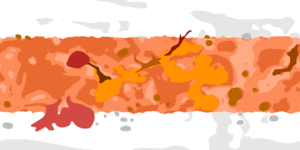 Between the altitudes of 30-45 km lies an isothermal layer, having a temperature of -123 °C. Air temperatures vary with latitude and time of day. At the equator, datum level temperatures vary between a nighttime low of -20 °C and a daytime high of -2 °C. At the poles, the temperature varies between -90 °C and -85 °C. Since Duna has no axial tilt, there are no seasonal temperature variations. Duna's atmosphere appears to have a reddish or brownish color, both from the surface and from space. The atmosphere has this color even over the poles, where the surface is white. The thickness of Duna's atmosphere makes it suitable for aerocapture from a high-speed interplanetary intercept. The periapsis altitude required for a successful aerocapture depends on the spacecraft's drag characteristics, its approach velocity, and the desired apoapsis of the resulting orbit. The most effective periapsis for aerocapture is best determined experimentally; however, for a Hohmann transfer originating from Kerbin, it appears that the target range lies between 10 km and 20 km. Although parachutes will deploy on Duna, the atmosphere is so thin that they are usually unable to slow a craft to a safe landing velocity and must be assisted with engines. Parachute performance can be particularly troubling when attempting to land in highland areas. Attaining the same vehicle descent rate on Duna that a vehicle would have on Kerbin requires about 2.5 times the parachute area. Below 5 km Duna's atmosphere is thick enough to allow wings to generate enough lift for aerodynamic flight. Jet engines don't work for want of oxygen, but other propulsion methods work well. Performing a horizontal landing with a plane is also possible. An ascent to low Duna orbit from the surface typically requires around 1400 m/s in Δv to reach a 55 km altitude traveling at roughly 900 m/s. The synchronous orbit of Duna is at an altitude of 2 880.00 km above Duna. The speed of the satellite is 306.88 m/s and it has an orbital period resonating with 1 Duna day (18.2 hours or 65517.859375 seconds). However, this is the same altitude at which Ike orbits, so unless a ship's orbit is perfectly precise, it will eventually be captured by Ike. For a semi-synchronous orbit of ½ Duna day (9.1 hours or 32758.9295 seconds) an orbit of 1 695.87 km above Duna is needed with a velocity of 386.65 m/s. Ike's orbit keeps it directly above a short range of Dunaian longitudes. The average Duna longitude that Ike tends to stay directly above (at the Zenith) is 6 degrees east, but the eccentricity of Ike's orbit causes the exact longitude to oscillate between about 2 degrees and 10 degrees east and makes Ike appear to grow slightly larger and smaller to an observer on the surface of Duna. The latitude at which Ike is in the Zenith also oscillates between 0.2 degrees south and 0.2 degrees north due to Ike's orbital inclination, making Ike appear to rotate upwards and downwards as viewed from the surface, but due to the extremely small orbital inclination, this effect is nearly imperceptible. These phenomena together are known as libration. The oscillation in Ike's position above the horizon allows areas from 88°W to 80°W and 92°E to 100°E on Duna to observe Ike rise and set at least partially across the horizon, as can any areas north of 89.8°N or south of 89.8°S. Parachute descent down to Duna surface. ISA satellite in orbit over Duna being used to map the planet surface. A topographic height map of Duna made with the ISA MapSat plugin. A color map of Duna. A lander on the northern pole of Duna. A rover at the edge of one of the "sinkholes." A small probe orbiting Duna. Ike partially eclipsing Kerbol. Note the dimmer light and the solar panels not charging. Duna and Ike as seen from a space telescope. ...but the journey is worth the effort! Duna's name may be either a reference to its desert landscape or a reference to the Frank Herbert novel Dune. The low-lying areas near Duna's equator make a shape resembling Europe. On the surface of Duna, there is a large monument carved in the likeness of a Kerbal face, alluding to the infamous "Face of Mars" discovered in the Cydonia Mensae region of Mars during the 1970's. Buried deep under the surface, there is a small camera, similar to the design on the Curiosity rover. One anomalous feature on Duna is a small, pyramid-like hill emitting an SSTV signal. When decrypted, it shows a diagram-like image of three figures standing next to the hill itself, which was originally part of the developer's story but later scrapped. Before 0.21, Duna was a more attractive planet with less procedural terrain. 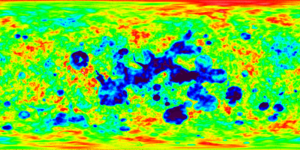 While there was a lower overall terrain definition, the majority of the planet was more deliberate and varied and higher in quality. 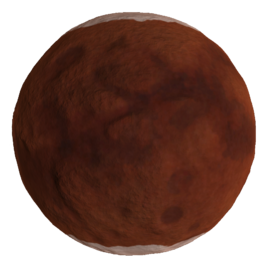 The current version of Duna is covered in procedural lumps and bumpiness, resulting in a distinctly "samey" appearance. Duna's color map uses some details that are blended in from the old Duna color map (as well as procedural PQSLandControl coloration) however, this color map is from the old version of Duna, before its "revamp" in 0.21. The color map references features which no longer exist on Duna, and is offset by about 180 degrees longitude. ↑ NovaSilisko's answer in “Duna's ice caps are too big”. This page was last edited on 2 April 2018, at 22:38.